Science is making rapid progress in unlocking Nature’s basic secrets, especially in the area of plants and food-stuffs, which supply more than just nutrients. One promising field is the variety of spices that have been used for centuries to add zest to a wide range of foods. Interestingly, long before the advent of refrigeration it was recognized that herbs and culinary spices could slow food spoilage–natural antimicrobial principles were obviously at work. Food scientists have become more interested in essential oils and aromatic plants. Recent studies have focused on the effects of spices and associated oils on food-borne organisms in the context of food safety and spoilage. Attempts have been made to identify the active components of essential oils from spices, among them the oil of oregano. Analysis revealed two phenolic compounds, thymol and carvacrol, as primary constituents of oregano extracts, and their antioxidant properties were reported. Biotics Research Corporation is widely recognized for its emulsified fat-soluble nutrients and other lipids, microemulsified with the practical objective of increased absorption and bioavailability. This technology has now been applied to the oil of oregano. By emulsifying oregano extracts, the effective surface area of the oil is dramatically increased. 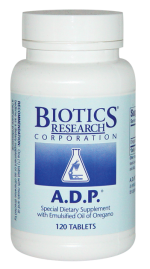 An additional step was to apply a sustained release mechanism to A.D.P.®, assuring a slow release throughout the digestive tract. The combined effect of emulsification and sustained release is to optimize intestinal exposure to the essential oil. We use ADP for parasitic, fungal and bacterial infections. It must be followed up with Bio Doph 7 a pre and probiotic. 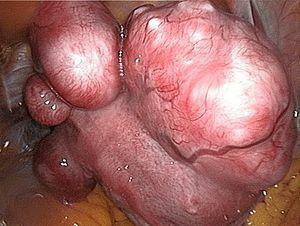 Fibroid – oid as in ‘like’ and fibr as in ‘fibre’. Ergo, we have “fibre oid”, fibre like. Fibre as in thread, for sewing, rope, etc. but in the human body, fibre helps hold our tissues together. Another name is extracellular matrix. This is like the scaffolding system used by the construction industry when fixing the floors of say, a leaky condo. The ECM or fibre scaffolding was thought of as purely structural factor. But recent information shows it helps tissue cells in survival, migration, performance, shape and function. Okay, we have damage, like the leaky condo, the structure had inferior components and the rain got in. The mold is getting worse. The tissue cells are damaged and in order to survive, they put up more scaffolding. Mold or fungus is prolific in spreading quickly. Here’s the follow up to our last blog on cysts. That criminal was staph, but which criminal damaged the fibre or tissue, let’s say in the uterus or breast or other area? Before I answer that let’s take a look at the criminal element. It’s a scavenger by nature, but given the opportunity to migrate, change shape, perform outside of its usual and then change the function of the tissue it occupies. Its conversion from scavenger to criminal comes from a change in food supply. In this case it is too much refined sugar, you know, junk food, the white food group, desserts, additives, etc. The scavenger, a yeast cell becomes a criminal when fed sugar and now it takes on a new shape and function. It carries a SPEAR, a mycelium, a deadly weapon which when injected into tissue, allows the criminal to enter its cells. It is now a full -blown FUNGUS. And there’s our answer to the cause of a fibroid. They proliferate at an extreme rate as they compete to stay alive against our immune cells. This causes an extreme immune reaction. Much like the staph being encapsulated into a cyst, these tissue cells are ‘sewn’ together by the immune system into a mass, a fibroid, to avoid further damage. The mass can weigh several pounds by the time it’s discovered, as often the person does not display overt symptoms. Put these two criminals together and you have cystic fibrosis. So, there are known reasons for unhealthy conditions to develop. Treatment of the symptoms does not allow a return to health. One example is a vaginal yeast infection. It is really a fungus infection and medically is recorded by the Pap test. If the tissues are sewn into a squamous epithelial papilloma or ‘wart’, it is recommended to have cryogenic therapy, and freeze dry the wart for removal. It must be common because the medical system wants young adults to be vaccinated for it. And do young adults always have the best diet? Biotics Research formulation for a fungus infection is in line with the agricultural industry, a fungicide; to cause suicide for the fungus. FC-Cidal is the product name. Deal with the cause, not the symptoms. That’s what biological medicine does. Order here. We also have access to Nutri-West and Standard Process products so if you are in the US, we can cross reference for these companies.